Documentary Photographer Paola Gianturco on Activist "Wonder Girls"
EYE: Hello Paola, how are are you? PAOLA: Hi Stacey! I am well. Happy to hear your voice. EYE: I can’t believe it’s been five years since we first spoke to you, and a lot has happened for you. In fact, you are one of the incredible women featured in our new book, 20 Women Changemakers: Taking Action Around the World. PAOLA: It feels wonderful to be in your book. I was so honored to be included with those other wonderful women who are really, as you say, taking action around the world. EYE: The last time we spoke you had a new book called Grandmother Power and that was the second in a trilogy. Now your third, Wonder Girls is out. How do you think Grandmother Power changed people’s perspectives about women around the world? PAOLA: Yes, my new book is being released on the United Nations International Day of the Girl Child on October 11th. It is the third in a trilogy that began with a book titled Women Who Light the Dark. It was stories of women activists around the world who were tackling the most intractable problems facing women and their families. 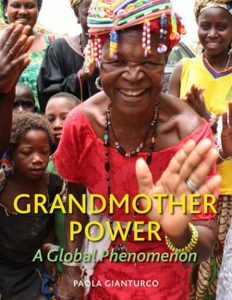 Similarly, Grandmother Power, a global phenomenon, looked at grandmother activists around the world. I was so honored and pleased on behalf of the women in that book when it was awarded the top literary prizes, four of them as a matter of fact, in categories as diverse as women’s studies and multi cultural non-fiction. So we had women, then we had grandmothers and now we have girls!…Wonder Girls, Wonder Girls: Changing Our World! EYE: Was this always the plan? Did you think ,”I’m just going to take some pictures and I’m going to change the world?” Was that your to-do list? PAOLA: Long ago when I started my first book, this is number six, I simply wanted to amplify the voices of women who were in fact changing the world. You talk about that phenomenon in 20 Women Changemakers asking, “Do you want to change the world?” In fact, I was so aware that women around the world were causing change, invisibly. EYE: Yes, that was the sadness about it. All of those amazing things were going on in the dark until you brought them to light. PAOLA: You all have done exactly that as well, talking about ordinary women doing extraordinary things. We were essentially “kissing kin” from my very first book, In Her Hands: Craftswomen Changing the World. In that book, I talked with women artisans who were just starting businesses at the very beginning of the microcredit surge. They were so conscious of the fact that women were able to send their daughters to school. In cultures where men were very often given the prerogative to spend the money they earned, the men wanted things like radios. Women were the ones feeding and educating the children. I wanted to document that. That was really the beginning from the very first book. It was an area that really excited me. I have discovered that girls, now, have joined this trend. These are not girls who are working individually like Malala. Of course, she is doing fabulous work. Wonder Girls is about groups of activist girls, who have found strength in numbers and have really caused changed. They are really very young, ages 10-18. EYE: Just when you think kids can’t rule the world, on some level, maybe they are! They’re making a difference. PAOLA: I was dazzled. They are not just changing the world of the future; they are really changing the world right now. The present. For example, there are girls who belong to the Girls Empowerment Network in Malawi that was launched by a young woman, aged 13. She was so appalled that her younger sister, age 11, had become pregnant. She vowed to work to end child marriage in her country, and she has organized girls all over Malawi. They worked together for five years, tirelessly, to lobby Parliament to change the law. This was such a pervasive practice in Malawi that half the girls in the country were married before they were 18 and most of them before they were 15. So two years ago, Parliament passed the law to outlaw child marriage in Malawi! Now they are working to implement it. They are not naïve enough to think they can stop, now that the law has been passed. They are continuing their work, spreading the word and causing social change that follows legal change. What a huge step from very young girls! EYE: And you have another story that is equally powerful. PAOLA: There were two sisters, Melati and Isabel Wijsen, ages 10 and 12, in Bali, Indonesia. They were so outraged by the amount of plastic that is now dumped on their beaches, ocean and land, that the island is no longer paradise-like, as it has been known to be. So they decided to organize the kids on the island of Bali and they started the campaign to gather a million signatures on a petition to outlaw the use of plastic bags on their island. They now have 71,000 signatures on their on-line petition, in addition to the ones they got by standing all around at the airport. When they had their first batch of signatures, they asked for an appointment with the Governor. He denied it. He dismissed them as “just kids.” So they called the press and explained they were going on a hunger strike. Their group is Bye Bye Plastic Bags. The Governor saw them the next day. EYE: What is fascinating is that you have a co-author, Alex Sangster. I first wondered if this was a boy or…and this is your 11-year-old granddaughter! PAOLA: Yes, it is my 11-year-old granddaughter from whom I learned more than you can ever imagine! It was wonderful doing this project with her. EYE: She actually wrote parts of this book, too! PAOLA: She interviewed 70 girls via Skype and FaceTime and asked the girls in each group what kind of help and support they need from the readers of the book, and the girls in their lives. So she wrote the last page of every chapter in the book based on her interviews inviting people to become engaged with the girls who are featured. PAOLA: I think we underestimate them. As we were working on the books, Alex was just outraged when she heard about child marriage. Girls in Kyrgyzstan told her about bride kidnapping, where boys drive up to the high school, grab a girl off the sidewalk, and take her home with them. Their families are waiting at home for the marriage. They may not even know the boy! EYE: So these girls go into action with no money, no funding? PAOLA: I think young girls have a natural sense of outrage and injustice that it propels them into action. What is interesting is that these girl-led groups are not well-funded. Some of them have seed grants. Some have grants from the Global Fund for Women. The girls essentially invent their activism from the air. For example, collecting the 71,000 signatures on the Bye Bye Plastic Bags petition that they wrote and circulated in Bali. In Malawi, they found women chiefs whom they established collaborative relationships with and women in Parliament. They sought out women with power and became their associates and collaborators. It takes imagination and these girls have that. Working for justice, peace and equality—those three things are at the top of the list for the girls. Their arsenal is creativity and confidence and determination and dreams. So, they are compelled to cause change by their shock and righting wrongs. 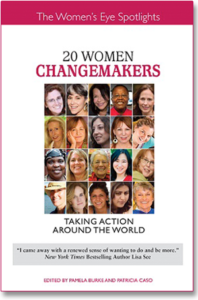 PAOLA: Just like your book, 20 Women Changemakers: Taking Action Around the World, this book provides role models and ideas about the effect women can have in causing change. I also hope that Wonder Girls will inspire adult women to work with the girls because these girls can do the types of things we’ve been talking about. Surely we can give them frequent flyer miles, sign their petitions, etc. There is much we can do to support them. 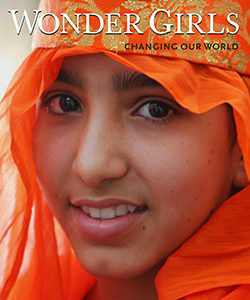 EYE: Wonder Girls Changing Our World is out October 11th, the same day as the International Day of the Girl Child. It’s available at your independent bookstores and Amazon. 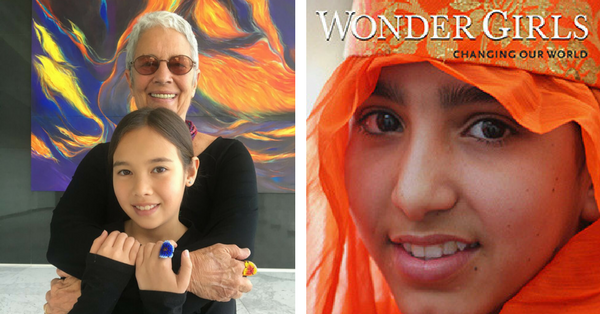 There will be an exhibit of the photos from the book from September through the end of November at the World Affair Council in San Francisco. PAOLA: Next it will go to Santa Fe and I hope it will go to other places, too. EYE: We just learned that Wonder Girls was featured on ABCNews.com! PAOLA: Yes! It was just featured on the ABCNews Home page. EYE: What did this ‘Wonder Girls’ experience do for you? PAOLA: It inspired me and lifted my spirits. Our world, as you say is so troubled, not just our country but our world. I feel really privileged to have been given these stories by these inspiring girls. It is a bight spot for me. EYE: Thank you so much for taking the time to talk with us today about Wonder Girls: Changing Our World. It’s just a beautiful, magnificent book. Very inspirational. And, thank you for being one of our 20 Women Changemakers.